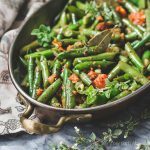 Mexican green beans, a healthy green bean recipe and a perfect low carb side dish made with onions, tomatoes and spices. Wash, trim and cut beans. Cut tomato in half and squeeze gently over the trash can to remove seeds, then dice. Chop onion and mince garlic and fresh oregano (if using). Heat 1 tbsp of oil in a large frying pan over medium heat. When hot, add the onion, garlic, tomato, and bay leaf until the onion begins to soften. Add the chicken base, water, other tablespoon of oil, oregano, cumin and green beans. Stir to coat the beans and loosely cover with a piece of foil or a lid. Cook for 4 minutes or until the beans are cooked to your preference. Add butter adjust seasoning by adding salt, pepper, or more oregano and cumin. Serve. *See post for additional ingredient ideas. I visually divide my veggies. I do not know how much volume a serving is as it depends on how long the pieces of green beans are. If this is divided between 4 people, the net carbs is 5 per person.